this looks like so much fun! makes me wanna schedule a crown-making session with my girlfriends. That looks like so much fun! I'll have to sign up for the mailing list so I don't miss any future classes. I bet they'll do it again. Just a hunch! I can just imagine how triumphal one would feel cycling on a summer evening with that crown and that song. Love it on the LP too. Oh yes, the perfect cycling accessory! So long as it didn't fly off in the breeze, haha. What a fun thing to do. So wonderfully feminine in all the right ways. That looks like such fun! I LOVE the colors of your crown! I think they will, and thank you! Oh, the crown and pins turned out beautiful! And Lana regally sitting there with tigers on her sides is pretty good inspiration. Thank you! And yeah, I kind of want to make a two-tone blue one. I feel like flower crowns are essential to summer now. So pretty. so many pretty things all in one space! looks like such fun! It was so fun! Definitely a step up from my usual Wednesday night activity of lying on the sofa with Netflix or whatever. Haha. Only a few are up there now but I will be adding kits all week! Thanks for the link! I added it above. your headband is gorgeous! i wish there was a flower crown workshop near me because i'd definitely go after seeing your and all of those pretty paper flowers! You can get the flowers here! http://www.etsy.com/shop/DIYfloralshop You could make one yourself no problem, clever girl! Oh, I'm sad I missed this. I will have to sign up for their newsletter in case there is another one. Or buy the flowers and make my own. Is it pretty straightforward? Next time! It is pretty straightforward, I just like sitting around and chatting with lovely ladies. so pretty! i love the muted tones and the blues in your headband. Thank you! I had to be me, haha. Oh, such a sweet project for little girls! How beautiful Anabela. 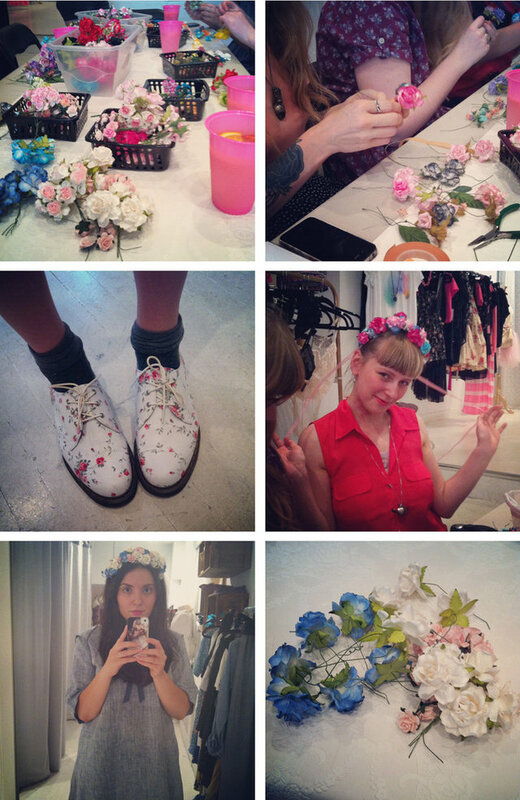 Flower crowns remind me of my childhood so much - my mum and grandmother used to make them for my birthday. They're both so skilled with all sorts of crafts, I wonder why I didn't get that gene! Your crown is so lovely. Thank you, Hila! And you're so clever in other ways that even if you didn't get that one gene, I wouldn't feel too badly! Plus I find that crowns are forgiving... no such thing as perfect. In love with these style head pieces! -cannot wait to pull it out to wear. You have inspired me to start wiring my spare faux flowers now! that is so pretty! I love all the flower crowns I've been seeing lately. yours came out lovely. These are so gorgeous- I love the flowers. Does she make them herself? I would love to learn how to make the flowers. No, the flowers are purchased.